Breeding a dog with one testicle can perpetuate the problem in any breed. If a dog only has one testicle, the cause is typically a case of monorchidism or cryptorchidism. Share some dog owner's concerns and learn more about these conditions and how a missing testicle or a retained testicle might affect a dog's fertility and health. When I bought my Pom, I never got around to registering him, and I'm glad I didn't. As he got older, I realized he had only one testicle. My question is whether I should have the testicle removed since I've heard it can cause cancer. Is this true? He will be three years old soon. When I told the breeder about the testicle problem, she said she had never heard of any other of her babies having this condition. I will be looking for another male soon. Is there anything I can look for or I should do if I get another one like this? I will not go to the same breeder again. 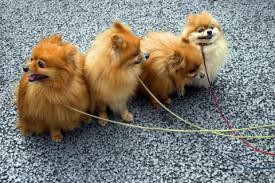 Has your Pom been examined by your veterinarian yet? His lack of a testicle could be due to one of two conditions. Monorchidism is a condition in which only one testicle is developed. Cryptorchidism is a condition in which two testicles are actually present, but one is significantly smaller and often doesn't descend into the scrotum, instead remaining in the abdominal cavity. It's also possible that neither testicle descends and both are retained. Your vet can use ultrasound and/or a blood test for testosterone levels to determine which condition your dog actually has and help you decide on a course of action. Monorchidism is a genetic defect that can be passed on from one generation to the next, so you may want to consider having your dog neutered to eliminate this possibility. I personally had a Chihuahua that was diagnosed with Cryptorchidism, and my own vet rejected the notion that the retained testicle would cause cancer, so I elected not to have the retained testicle removed. My pet is still cancer free after six years. Since there does seem to be some controversy over whether either of these conditions predispose a dog to developing cancer, I highly recommend that you seek your vet's educated opinion on the subject. However, having your male neutered is still probably a good idea, since you won't want to breed him. As for any future male pup you may buy, ask whether the breeder is willing to provide a written guarantee that the pup will have both testicles, and will replace him if he doesn't. Most reputable breeders are willing to do this. You should also take any new pup to your vet for a complete examination the week you purchase him. Your vet should be able to palpate him to see if both testicles are present. Males can actually be fertile as young as four months old, but most aren't up to the task at this age. The testicles should also have descended by this time. If they are retained any longer, a dog is usually sterile. If one or both never descend, a dog is at higher risk for testicular cancer. I think the best advice at this time is to keep your male and female separated until her season is completely over. This way you can avoid having a litter as well as give your male time to finish maturing.